VANCOUVER, July 17, 2018 /CNW/ - Bonterra Resources Inc. (TSXV: BTR) (US: BONXF) (FSE: 9BR1) (the "Company" or "Bonterra") is pleased to announce the latest drilling results from the ongoing Resource Development Program at the Gladiator Gold Deposit, including an intersection of 15.3 g/t Au over 2.7 m, extending the Footwall Zone down-plunge to the east. Recent drilling results extended mineralization along multiple zones and continues to demonstrate the continuity of the high-grade gold mineralization at depth and along strike at the Gladiator Deposit. - Infill and extension drill results continue to demonstrate the continuity of the deposit, highlighting the predictability of the mineralized zones. - Hole BA-18-54 intersected the Footwall Zone with 15.3 g/t Au over 2.7 m approximately 500 m below surface. This intersection increases the Footwall Zone considerably in both size and grade, expanding the potential down plunge. - This intersection increases the Footwall Zone considerably in both size and grade, expanding the potential down plunge. - Step out hole BA-18-44 intersected the Footwall Zone with 9.1 g/t Au over 2.0 m, expanding mineralization westwards in the Rivage area, and opens the zone to depth on westside of the deposit. - Hole BA-18-49A intersected the North Zone in the Rivage area with 12.2 g/t Au over 1.5 m, extending the depth, and opened up new high-grade mineralization down plunge to 300 m below surface. - Hole BA-18-50 intersected the South Zone at 300 m below surface, proving the predictability of the geological model and adding definition to the high-grade chute recently defined at the east side of the deposit. - BA-18-48 intersected the North Zone and expanded the high-grade chute up plunge towards surface in the east side of the deposit with 12.6 g/t Au over 1.3 m.
- To date, continuity of mineralization is now confirmed over a total drilled strike length on at least four horizons (North, Footwall, Main and South) of 1,200 m, as well as a drilled depth of over 1,000 m.
Positive results from step out drilling in both the Rivage and eastern areas of the deposit continue to indicate the potential for further expansion of the Gladiator Deposit along defined high-grade chutes and highlights the predictability of the geological model. Infill drilling at the Gladiator Deposit also validates the model and demonstrates the continuity of the mineralization. The resource development program continues with five drills at the deposit focused on infill and step-out drilling in preparation for the updated mineral resource estimate in Q4 2018. 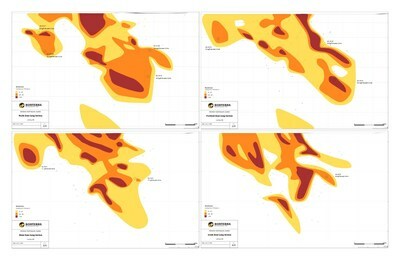 Please see http://bonterraresources.com/projects/gladiator-project/maps-sections/ for updated maps including long sections and cross sections. - Advancing to the completion of an updated NI 43-101 Mineral Resource Estimate in the Q4 2018. - Drilled dimensions of the Gladiator Gold Deposit are currently outlined to a depth of over 1,000 mbelow surface and a strike length of 1,300 m.